Until February 7, 2017, Noah was a healthy, high-functioning autistic boy. On this day, he ran a fever, but showed no other symptoms. He went back to school on the 9th, played and took a nap as usual. When he woke up, his eyes were puffy but had no other complaints. On February 10th, Noah was very lethargic, his eyes were still puffy and he hadn’t urinated in 24 hours so I brought him to the local hospital where they ran blood tests, flu and strep tests, a urine test and gave him intravenous fluids. The doctor came in and told us he is perfectly healthy, just something viral, take him home and let him sleep it off. They sent us home with a prescription for nausea medicine. they again ran tests and gave him more Intravenous fluids. decided that he had a problem with his kidneys. There was only one pediatric kidney specialist in the state and he was at Tulane Hospital. They transferred us via ambulance there. On February 12th, the doctors were not convinced that his problem was his kidneys. He developed dif culty breathing and on chest x-ray they found fluid on his lungs and around his heart. He was placed in the ICU. Within an hour, the doctors said he needed to be ventilated and have a heart catheter inserted. They decided to transfer him to the pediatric ICU at Ochsners Hospital. We repeated the same story to the doctors there. They decided to take a step back and redo all the tests. The tests came back positive for u, at which time the doctors told us that it was the u that had affected Noah’s heart and gave him Myocarditis, which was causing all the extra fluid and his heart failure. 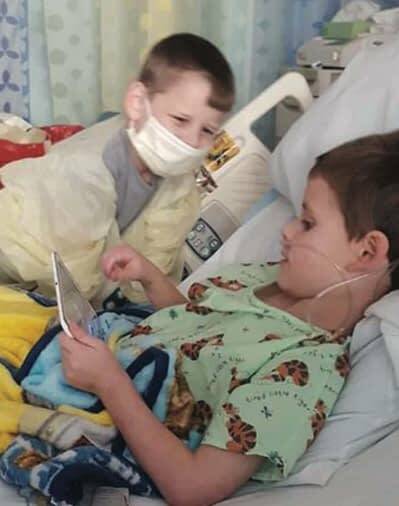 On February 13th, Noah crashed for the second time and they decided to put a “heart catheter” into his heart, drained the extra fluid around his heart and in his lungs, and he gradually started to improve. He came off the ventilator on the 15th and the heart catheter was taken out as well. He cried and was very scared. We cried with him too. Little by little every day another line or tube came out. By the 20th, Noah was walking around the ICU with Physical Therapy and finally able to eat real food again. On the 21st, all the tubes were out and he was transferred to the pediatric floor. We were sent home on February 22nd. So much had happened over the past 2 weeks. Noah still has monthly checkups, which will decrease over time. His doctors believe that he will go on to live a healthy life. We are so lucky and blessed and want to spread awareness and hope for families also affected by myocarditis.